Nanjing City Guide. China Travel Services. CTS. Los Angeles. San Francisco. Nanjing (meaning “southern capital”) is one of the six ancient capitals of China (from the beginning of the 3rd century until the end of the 6th century), and is situated on the south bank of the lower reaches of the Yangtze River. Today, Nanjing is the capital of Jiangsu Province and covers an area of 860 square kilometers with a population of more than 5 million. Various dynasties have made Nanjing their base. The most famous of these periods was when Nanjing was the capital of China during the Ming Dynasty between 1368 and 1644, and also during the establishment of the People's Republic of China in the early 20th Century. Many of the city's historical sites date back to these periods, and Sun Yatsen's Mausoleum and the Ming Tombs are examples of the wealth of culture existing in this ancient city. Today, the city is renowned for being an educational and cultural center, with a large student population (both foreign and native Chinese). Nanjing is a charming city with tree-lined streets, hills and lakes, making the intense heat of east China's summers more bearable. The pace of life here is slower than many other Chinese cities and Nanjing seems quite conservative in comparison to the brash modern ways of neighboring Shanghai. The local mantra "man zou" (go slow) is a reflection of the cautious and reserved attitude of many of the city's residents. There are some 40 universities and colleges plus more than 300 scientific research institutions in modern Nanjing, several art troupes and a theatre for kunqu opera, from which about 100 modern operas in China derived. The Nanjing Library is the third largest in China in terms of its collection. The Nanjing Museum boasts a rich collection of arts and crafts. Modern Nanjing is the economic and cultural center for the lower reaches of the Yangtze River. Boasting more than 20 professional craft workshops and over ten thousand skilled workers, Nanjing produces various kinds of handicrafts. Among the different goods produced are the: cloud-pattern brocade, velvet, imitations of ancient ivory carving and wood carvings. The best place to buy souvenirs is in the area around the Confucius Temple. Be prepared to bargain, as bargaining is a local custom. The Rain Flower Pebble (yuhuashi) from the Yuhua Terrace is a popular souvenir and many pebbles carry a specific tale or legend with them. A legendary saying revolves around the Liang of Southern Dynasties (502-557) when Master Monk Yunguang was expounding the texts of Buddhism at Jubao Mountain. They say that heaven was so moved that it rained flowers, so that the colorful pebbles with beautiful patterns and trails in the mountain are called rain flower pebbles. Yuhuashi is a compound of quartzite, flint and agate with the popular name of rain-flower agate. The Mausoleum of Sun Yat-sen (1866-1925), the great pioneer of the Chinese revolution, was built after his death between 1926-29 on the southern side of Zhongshan Mountain, in the eastern suburbs of Nanjing. It has since been designated a national tourist site. The 73-meter-tall mausoleum, situated 159 meters above sea level, is composed of a 392 flagstone stairway, a pavilion with a stone tablet under its roof, a memorial hall and the tomb. A marble statue of the deceased in a reclining position is placed in the tomb chamber and beneath the statue are his remains. The entire layout, which covers 80,000 square meters, takes the shape of a giant bell, looking solemn and breathtaking between a vast plain and a background of green mountains. The Purple Mountain Observatory is located on Tianbao Peak in the east of Zijinshan (Purple Mountain). Set up in 1928, it is now the site of the Zijinshan Observatory of the China Academy of Sciences. In addition to the modern scientific instruments, there are also some precious ancient astronomical instruments and apparatus on exhibit. Purple Mountain (Zijinshan) is also called Zhongshan (Bell Mountain) or Jiangshan. It was named Purple Mountain because the rocks at the top look purplish red in the distance. It is lush and towering with the main peak 448.9 meters high. Places of historic interest and scenic beauty on the mountain are the Dr. Sun Yat-sen Mausoleum, Mingxiaoling Mausoleum, Linggusi (Soul Valley Temple), and others. The Mingxiaoling Tomb is one of the biggest imperial tombs in ancient China. This graveyard of Zhu Yuanzhang, founding emperor of the Ming Dynasty (1368-1644), is situated below Dulongfu Wanzhufeng Peak in the southern foothills of Zijinshan. Square City, so called for its similarity to a citadel, is a pavilion housing an 8.87-meter-high memorial tablet erected by Emperor Chengzu in his father's Xiaoling Mausoleum. Yangshan Tablet Materials was chosen originally by Emperor Chengzu for his father's Xiaoling Mausoleum. The Sacred Path to Xiaoling Mausoleum is lined on either side with 12 pairs of stone lions, camels, elephants, qilin (Chinese unicorns), horses and four pairs of military and civil officers. The 110-kilometer-long Qinhuai River is a trunk waterway that meanders its way into the city of Nanjing from the southeastern corner. The section from Dongshui Pass to Xishui Pass, known as "Ten-Li Qinhuai" or "Inner Qinhuai", is famous in Chinese history as the epitome of what is called "Pomp and Pageantry of the Six Dynasties". In its heyday during the Ming and Qing dynasties, the river was flanked with luxury houses of green windows and vermillion doors and the water was plied by elaborately decorated lantern boats. The prosperity, however, declined during the mid-Qing Dynasty. Only recently has the river been refurbished and restored to its former glory. Scenic spots and places of historical interest include Bailu Sandbar on the river, Zhonghua Archway, Zhanyuan Garden, Taoye Ferry-crossing, Temple of Confucius, Wuyi Lane, and the residence of famous sing-song girl Li Xiangjun, known as “The Pavilion of Charm and Fragrance”. 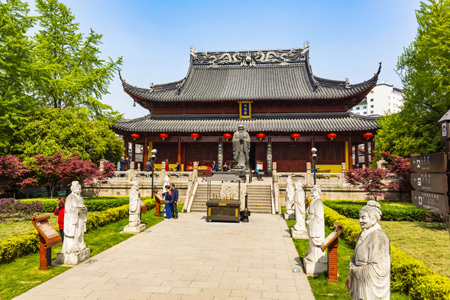 Situated in the center of the scenic area along the Qinhuai River in south Nanjing, the Temple was first built in 1034 for local people to pay tribute to Confucius. Having weathered the ups and downs over the years, the temple has now become a public cultural and entertainment center. There was a large-scale renovation program in 1985 when all the teahouses, restaurants and stores near the Temple of Confucius were remodeled or reconstructed in the architectural styles of the Ming and Qing Dynasties. The restaurants and eateries in this place offer about two hundred kinds of traditional food and delicacies. The nearby riverside Gongyuan Street, which has been transformed into a cultural and commercial center, lures visitors with its authentic traditional look. Xuanwu Lake was a recreation place for emperors and kings during the Song of Southern Dynasties period, and it was also used for their navy training. It was designated a park at the end of the Qing Dynasty. Surrounded by the city and mountains, this is the largest park in Nanjing. It boasts many places of historical interest and scenic beauty with thousands of willow trees on its banks. Mochou Park is a vast open area in the west of the city with a pretty lake and walking paths. This is an ideal retreat to escape from the city traffic and noise. Legend has it that during the Nan Dynasty, a poor girl named Mochou married a man in Nanjing to acquire enough money to bury her father. Unfortunately, the girl was so unhappy with her new life that she committed suicide by jumping into Mochou Lake. Situated two kilometers east of the Sun Yat-sen Mausoleum, Linggu Temple was first built during the Liang Dynasty. It was moved to the present site because of the construction of the Xiaoling Mausoleum during the Ming Dynasty. The temple's 22-meter-tall Hall of Amitayus was constructed without a single inch of wood, still less pillars and beams; hence the nickname "Beam-less Hall". Tourist attractions in the temple include the Stone Tablet for Three Wonders, the Pine-and-Wind Pavilion and the Linggu Pagoda. Qixiasi Temple is located at the foot of Fengxiang feng Peak and Qixiashan Mountain, 20 kilometers northeast of the city. It is a famous ancient temple of the Six Dynasties Period with the Dagoba, the cliff sculpture Qianfoya (Thousand-Buddha Grottoes) and other cultural relics. The Yangtze River Bridge, 4.6km long, is an impressive construction in the northwest of the city. The bridge was built in 1968 in honor of the capture of Nanjing from the Kuomingtang by the Communists. The Chinese are particularly proud of the fact that they managed to complete the bridge after Russia withdrew their promise of assistance. The structure and design of the bridge are particularly impressive. There are two decks; the upper level carries vehicles and passengers and the lower carries trains over the huge Yangtze River. The bridge is uniquely Chinese in style and on the sides of the top deck are statues depicting soldiers crossing the river. Visitors can access the bridge from the Great Bridge Park to the north of Zhongshan Road North. There are elevators taking tourists up to the decks which affords not only a great view of the massive river but also of the bridge's structure and architecture. Zhonghuamen, situated in the far south of the city is perhaps the finest remaining example of Nanjing's ancient city walls. Zhonghuamen ("The Castle of China Gate") is the largest gate along the wall and it is composed of three towers and four smaller gates inside one another. The gate is now separated from the rest of the wall and is located on a huge traffic island at a busy road junction. When constructed, this gate could hold up to 3,000 men at one time. The gate affords stunning views of the city and is a good place to see Nanjing's landscape and to get your bearings of the local topography. The Memorial of the Nanjing Massacre (datusha jinianguan) is on the site of the massacre by Japanese invaders in 1937 with a mass grave of the Chinese that were killed during the atrocities. The Memorial, built in 1985, is an imposing and solemn construction. The Museum documents the Japanese invasion via graphic pictures, a viewing hall and a display of the original furniture that was used during the signing of the Japanese surrender.The Museum is a somber and solemn place but also provides an insight into the atrocities of 1937. The Nanjing Museum is located inside the Zhongshan Gate at the southern foot of Zijin Mountain as a famous museum of art and history. Originally named "Preparatory Committee of National Central Museum", it was first built in 1933 on the proposal of Mr. Cai Yuanpei. The name was changed to Nanjing Museum in March 1950. It now houses 420,000 pieces of cultural relics from ancient China through modern times. Traditional Nanjing cuisine is known as Jin Su cuisine and is notable for the emphasis placed on original flavor and carefully selected raw ingredients. Nanjing dishes are traditionally bright in color and use only a moderate amount of seasoning but a significant amount of oil. Jin Su specialties that should be sampled include: Jinling roast duck, steamed duck cutlets, salted duck, Longchi carp and "Eight delicacies soup". The "Eight delicacies" are: fish, water chestnut, lotus root, wine, parsley, arrowroot and lotus seeds. This is a popular dish especially around "Moon Festival" time (roughly the middle of August). There are numerous classical restaurants serving up these delicacies and the area around the Confucius Temple has some great places to taste authentic Nanjing food. Western and Japanese food is also becoming increasingly popular and there is a good selection of Western and Chinese food available around the universities off Shanghai Road. The big hotels such as The Hilton and The Jinling also have a selection of fine restaurants. McDonalds and KFC franchises are very popular for those preferring something inexpensive western food. Nanjing boasts a highly developed transportation system with its own international airport, railway station and numerous bus stations. The city is also strategically located on the Yangtze River and many boats operate in and out of the city's port. Nanjing Lu Kou Airport is one of the largest airports in the nation. Nanjing Airport has regular daily connections to all the major Chinese cities and there are also flights to Hong Kong. The airport is 35km from the urban area and is connected with the city by a highway (driving time approx. 45 minutes). The main long distance bus station is near the train station in the north of the city. However, getting reliable information about bus services can be difficult. You can try asking in the major five star hotels and there is a bus ticket office at 209 Zhongshan Road North. The buses themselves are generally good and timely with bus services operating to Shanghai (3-4 hours), Suzhou (2 hours), and Hangzhou (5-6 hours). There is also an overnight bus to Wuhan, which now takes less than 12 hours. Touts also stand outside the bus station vying for passengers to fill up their private cars as unlicensed mini cabs. These drivers are generally heading for Shanghai and this can be an efficient and fast way to get between the two cities. The drivers won't leave until there are four people in the car however. This doesn't normally take long and once the car is full, the trip takes around three hours. The driver normally charges approximately RMB100 per person. Nanjing also has excellent rail links especially to Shanghai (4 hours), Suzhou (2 hours), Hangzhou (5-1/2 hours), Anhui Province and Beijing. The newly renovated Railway Station is located in the north of the city and the soft seat entrance is to the right of the station as you face it. Train tickets are available here, or at a ticket office near Gulou on Zhongshan Bei Road. Most major hotels can also get tickets for a small service charge. This is a good option as it is much easier than queuing up at the train station. Nanjing has a developed river transportation system and passenger ships for the following destinations depart on a regular schedule: Shanghai, Hangzhou, Suzhou, Chongqing (5 days) and Wuhan (2 days). The length of the journey varies depending on the type of boat you travel on. This is a lovely way to travel between some of the more popular spots but it can be tiring and time consuming. The port in Nanjing is on the western side of Zhongshan Road North. Getting about in the city itself is usually easy as there are ample taxis around town and an efficient (though crowded) bus service.